Interaction Overview diagrams visualize the cooperation between other interaction diagrams to illustrate a control flow serving an encompassing purpose. As Interaction Overview diagrams are a variant of Activity diagrams, most of the diagram notation is the same, as is the process of constructing the diagram. To create an Interaction Occurrence, simply drag an Interaction diagram from the Project Browser onto your Interaction Overview diagram. The ref frame displays, encapsulating an instance of the Interaction diagram. You generate Interaction Overview diagram elements and connectors from the Activity pages of the Toolbox. 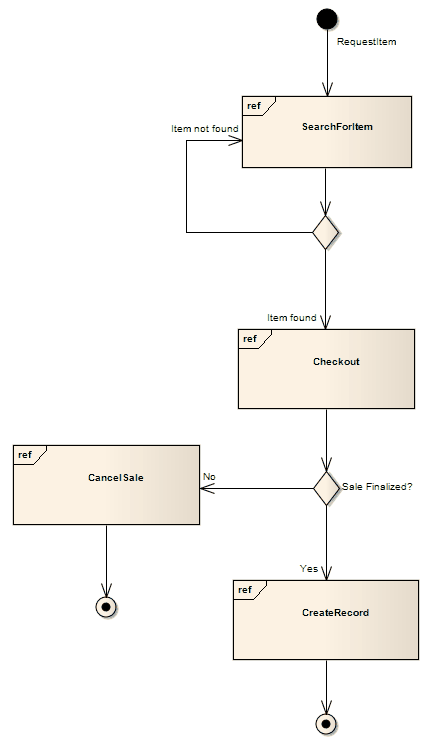 This diagram depicts a sample sale process, shown in an Interaction Overview diagram, with sub-processes abstracted within Interaction Occurrences. The diagram appears very similar to an Activity diagram, and is conceptualized the same way; as the flow moves into an interaction, the respective interaction's process must be followed before the Interaction Overview's flow can advance. A Partition element is used to logically organize elements. A Decision is an element that indicates a point of conditional progression: if a condition is true, then processing continues one way; if not, then another. The Send element is used to depict the action of sending a signal. A Receive element is used to define the acceptance or receipt of a request. A Synch state is useful for indicating that concurrent paths are synchronized. They are used to split and rejoin periods of parallel processing. The Initial element defines the start of a flow when an Activity is invoked. The Final element, indicates the completion of an Activity; upon reaching the Final, all execution is aborted. The Flow Final element depicts an exit from the system, as opposed to the Activity Final, which represents the completion of the Activity. Enterprise Architect supports two types of Region element: Expansion Regions and Interruptible Activity Regions. An Expansion Region surrounds a process to be imposed multiple times on the incoming data, once for every element in the input collection. An Interruptible Activity Region surrounds a group of Activity elements, all affected by certain interrupts in such a way that all tokens passing within the region are terminated should the interruption(s) be raised. The Exception Handler element defines the group of operations to carry out when an exception occurs. A Merge Node brings together a number of alternative flow paths in Activity, Analysis and Interaction Overview diagrams. A Fork/Join element can be used to: 1) split a single flow into a number of concurrent flows, 2) join a number of concurrent flows or 3) both join and fork a number of incoming flows to a number of outgoing flows. The Control Flow is a connector connecting two nodes, modeling an active transition. An Object Flow connects two elements, with specific data passing through it, modeling an active transition. The Interrupt Flow is a connection used to define the two UML concepts of connectors for Exception Handler and Interruptible Activity Region.